For a while now we have seen very tempting photos in our twitter feed from the Candlelight bar in Dundrum, always promising a visit, well last week we did just that. Location wise, it is situated in the outdoor courtyard beside the very popular Harvey Nichols. The Candlelight bar is actually part of the Siam Thai restaurant, however it is on the second floor completely separate from the restaurant itself. Walking into Candlelight, as you would expect, the venue is dimly lit with the sound of smooth jazz. We were greeted by the lovely Avila Candlelight’s manager, who tried to work out what cocktails we would like, while guiding us to our table. If it hadn’t of been a cold and rainy night we would have asked to be seated on the terrace, which has an amazing view of Dundrum’s main square. 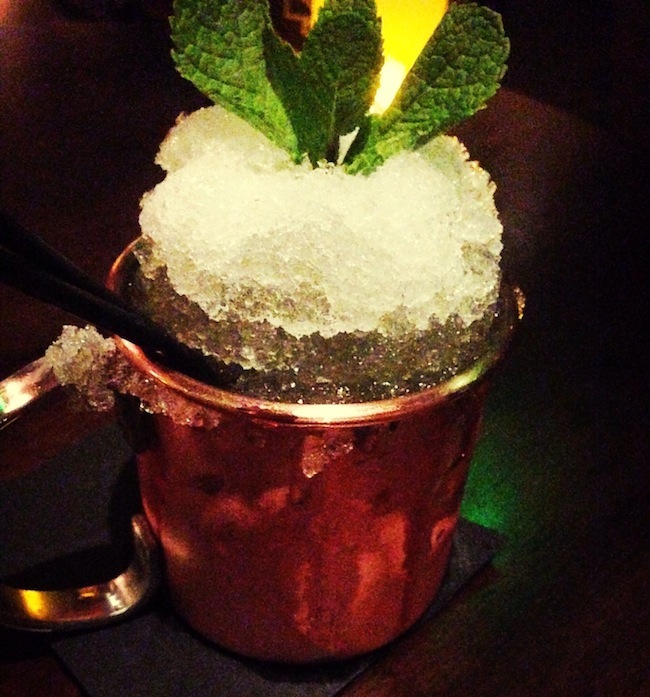 We decided to go for Hellfire Club Julep which consisted of Applewood Smoked Jameson, Mint, Camomile tea Syrup and Fennel Tinctur, this is an award winning signature cocktail. The cocktail arrived enclosed over the top, once opened, the cocktail glass was surrounded by smoke, which gave a very dramatic effect. Darren the resident mixologist puts a sterling effort into each unique concoction, no surprise then that Candlelight has just been shortlisted for “Best New Cocktail Bar” in the Irish Craft Cocktail awards 2014 and deservedly so . This is definitely a cocktail venue worth trying, with plenty of live acts and the 12 nights of Candlelight with live music every night starting mid December. Open 7 nights a week until late with DJs and live music.